UPDATED: Tor Mikkel Wara, a former liberal star within Norway’s conservative Progress Party, has made a major political comeback. 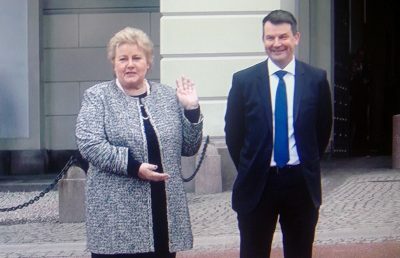 Prime Minister Erna Solberg presented Wara on Wednesday afternoon as her new justice minister after an extraordinary Council of State at the Royal Palace. Both newspaper Dagbladet and Norwegian Broadcasting (NRK) had reported earlier in the day that Wara, who once was thought to be a future leader of the Progress Party, would be replacing Sylvi Listhaug, who was forced to resign as justice minister just before Easter. NRK reported that one party insider called Wara “a legend who’s now making a grand return.” He confirmed on Wednesday that he has worked closely with Progress Party leader and Finance Minister Siv Jensen for several years, not least since the party (Fremskrittspartiet, Frp) won government power for the first time in 2013. Jensen was not present, though, when a smiling Solberg and Wara walked out of the palace at 3:40pm to pose for photos. Wara is Solberg’s fifth justice minister in just the past 16 months: Per-Willy Amundsen replaced Anders Anundsen in December 2016 but was himself replaced by Sylvi Listhaug after last fall’s election. She lasted only a few months until being forced to resign over inflammatory comments. Her immediate successor, Per Sandberg, will now return to his post as fisheries minister. All have come from the Progress Party. Solberg, leader of the Conservative Party and the coalition government, told Norwegian Broadcasting (NRK) after a press conference that she now hopes for more stability and to get back to running the government after a turbulent winter. “Welcome back to national politics,” Solberg told her new justice minister at the press conference Wednesday afternoon. She stressed the importance of the portion of his portfolio that deals with national emergency preparedness, but noted how he will also be in charge of law and order, immigration and integration. Wara, now age 53, was widely viewed as the Progress Party’s “wonderboy” in the 1980s, and an heir-apparent to then-party leader Carl I Hagen. 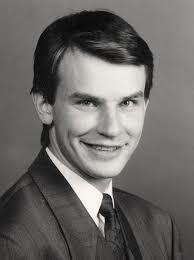 The native of Northern Norway, born in Karasjok, began his political career as the leader of the party’s youth organization FpU in Vadsø in 1982. He rose quickly, eventually becoming finance policy spokesman and a member of the Oslo City Council until he was elected to Parliament for a four-year term that began in 1989. Wara was a liberal voice within the otherwise conservative party that’s long been viewed as Norway’s most right-wing with representation in Parliament. When he and other liberals lost a power struggle within the party in 1994, he turned down re-election to Parliament and cancelled his membership in the party’s youth organization. Wara then distanced himself from both the Progress Party and national politics, warning against its move towards populism and opting to launch a new career in public relations and communications instead. He said he has had “many conversations” with Jensen in recent years, however, especially after she took over for Hagen, and both are viewed as being part of the party’s more moderate wing, leaning more towards cooperation than confrontation. That will be a relief for many following Listhaug’s period that was full of confrontation and tough talk: “I am not Sylvi Listhaug, I will speak in my own way,” the affable Wara told reporters when he took over his new office later in the afternoon. He insisted, however, that he will carry out his party’s and the government’s restrictive asylum and immigration policy that is a constant source of debate in Norway. NRK reported that he became more involved with the party again several years ago, “holding speeches at both the central level and in various county chapters,” according to one source. While he’s still viewed as a moderate, he mentioned that his more liberal attitude towards immigration and integration was a product of the times “25 years ago.” He claimed his moderate views on immigration “proved to be optimistic,” adding that “there will be no change in policy” during his tenure. Sandberg, meanwhile, had been temporarily named to succeed Listhaug when she was forced to resign because of her inflammatory and offensive rhetoric just before Easter. Sandberg has a police record, however, stemming from an assault conviction in the 1990s. That, along with his own hesitation about taking over as justice minister, created uncertainty over whether he’d be formally appointed. Solberg said she was “quite sure” that Sandberg was now “a happy man” who will return to the fisheries sector that’s second only to oil in its contribution to the national economy. Wara’s appointment didn’t come without controversy. He’s been working since 2010 for the Oslo-based communications and PR firm First House, founded by a brother of Crown Princess Mette-Marit and known for being staffed by many former top politicians. First House has often been criticized for alleged conflicts of interest, its secret client lists and heavy lobbying activity. Wara was the First House partner who defended the firm’s confidentiality with its clients, arguing that “it must be possible to become a policitian after working in the business world. We have promised our clients not to reveal who’s on our client lists.” He defended it on Wednesday as well, but said he will be “carefully” going through his client lists to weed out any potential conflicts of interest. Solberg has been informed about many of his clients and First House revealed several of them itself, after obtaining their permission. They included the Rema 1000 grocery store change, Ringnes breweries, cable TV company Get and several international companies. It emerged during Listhaug’s brief stint as justice minister that she had worked for the national sports federation on its unsuccessful efforts to hold the 2022 Winter Olympics in Oslo. Wara stressed that he worked mostly with business clients “that normally don’t have much to do with the justice ministry.” He has also now sold off his ownership stake in First House and resigned as a partner.